First, get past the horrible cover-art of Ancient Shores. Perhaps this is attractive to a subculture of readers, but it is not to me. 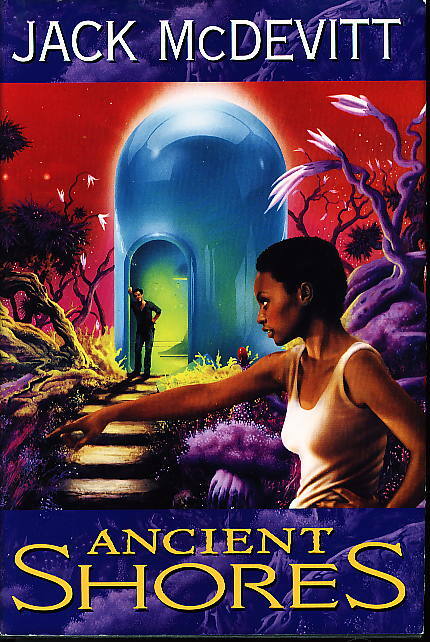 If Ancient Shores had not been recommended to me by my favorite high school teacher, the cover art alone would have dissuaded me from buying it. OK, now that’s out of the way. For want of a nail the kingdom is lost — that’s how the catechism goes when you boil it down. In the end, you can boil everything down to something similar — or so Roberta Anderson thought much later on. It’s either all n accident… or all fate. Anderson literally stumbled over her destiny int eh small town of Haven, Maine, on June 21, 1988. The stumble was the root of the matter; all the rest was nothing but history. “If that ain’t the damnest thing.” Tom Lasker had to raise his voice to be heard over the wind. Will paused with his spade full of black earth to see what had drawn his father’s attention. Both The Tommyknockers and Ancient Shores concern the discovery of an ancient vessel in a field near a small town in an out of the way state. The difference is what the author chooses to focus on. Stephen King focuses on the person of Roberta Anderson, her emotional and physical well-being, and her relationships with her neighbors. Jack McDevitt writes much flatter characters, but focuses on the political and economic consequences of such a find. McDevitt’s weak description of characters contrasts nicely with his beautiful description of place. Ancient Shores is probably the most realistic description of life in the Dakotas I’ve ever read in a work of fiction. Likewise, the relationship between the Sioux reservation and the white town near the objects is painted vividly, without the bathos such a setting would normally draw out. Rapidly the reader learns the “shark’s fine” is part of a yacht made of trans-uranic elements that seemingly sailed on the dead Lake Agassiz. What happens next, of course, is the story. Ancient Shores is also only a third of the length of The Tommyknockers, making it much quicker to get through! I read Ancient Shores in the Nook edition. It is also available for Kindle.